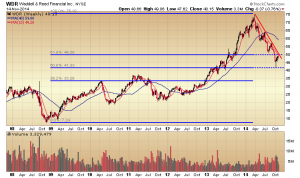 Google (GOOGL) failed to recapture its 50 or 200 day moving average earlier this month, and this week has broken support in the $550.00 level. 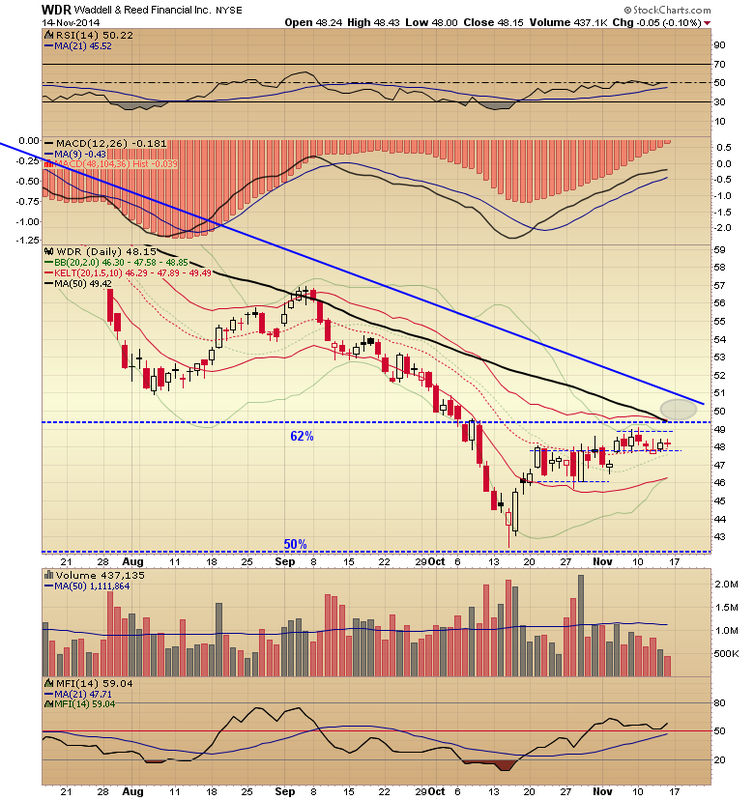 The MacD is making a bearish crossover and Chaikin Money Flow is entering negative territory. At this point in time and price, it looks like the October low is a potential downside target. 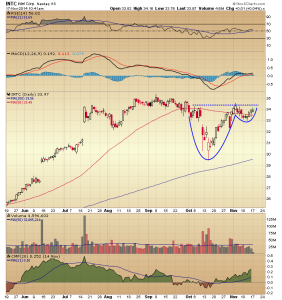 Intel (INTC) shares are attempting to break above the rim line of the cup and handle pattern, I highlighted yesterday on the daily chart. The Russell 2000 iShares (IWM) fund closed at the low of the day. 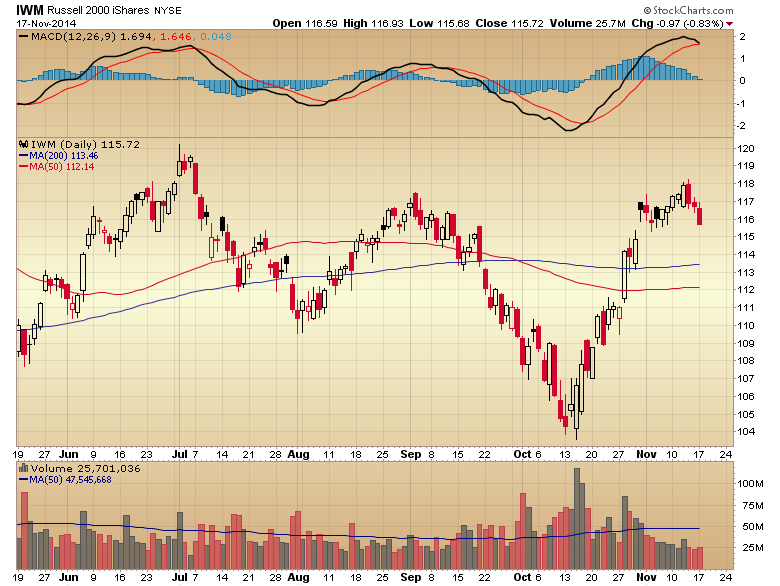 Volume has been well under the 50 day moving average of volume this month, and the MacD is making a bearish crossover. 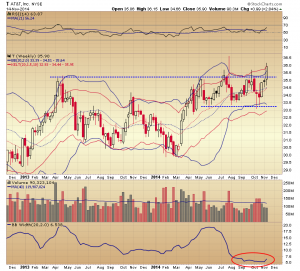 Regeneron Pharmaceuticals (REGN) continues to trade within measured channel moves on its daily chart. 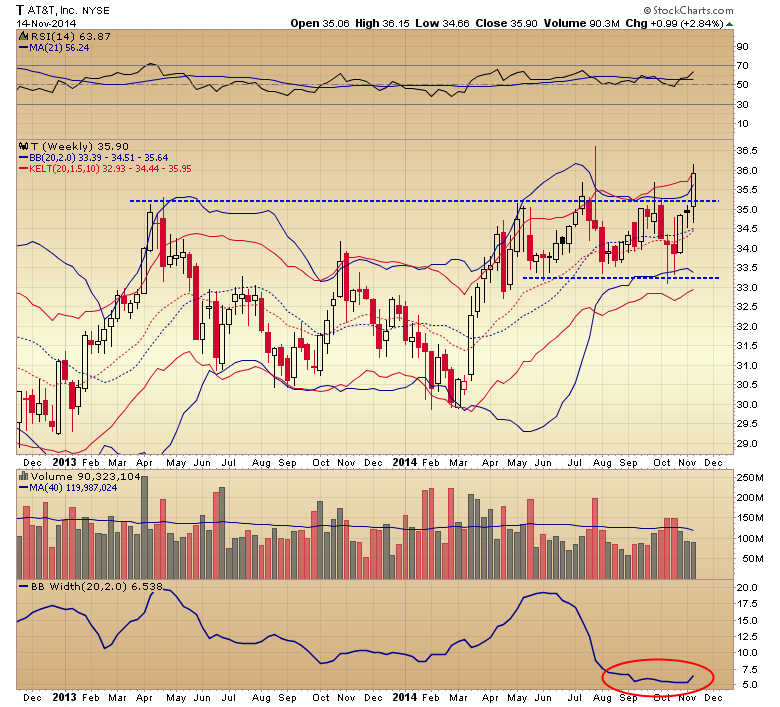 Today’s high touched the October high, the projected pattern target of the previous channel breakout. 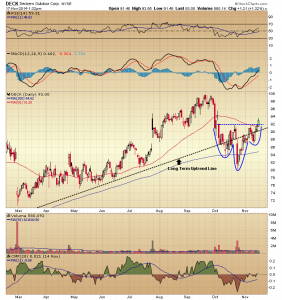 Shares of Deckers Outdoors (DECK) are breaking above the neckline of an inverse head and shoulders continuation pattern on the daily chart. 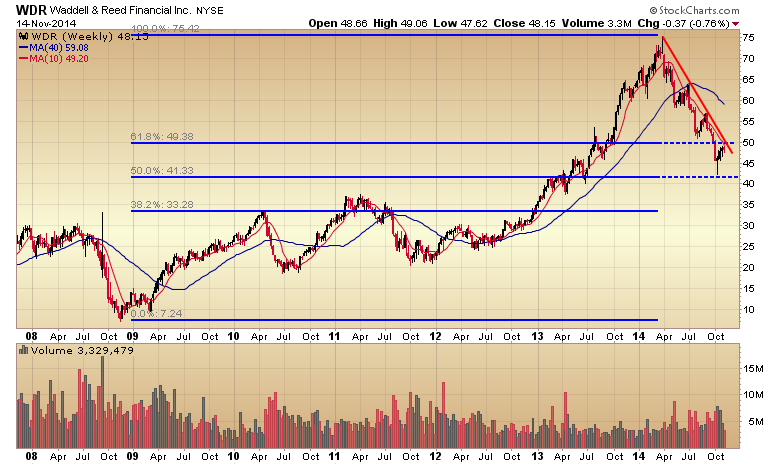 The stock recently dropped below a long tern uptrend line drawn off the lows since 2012. 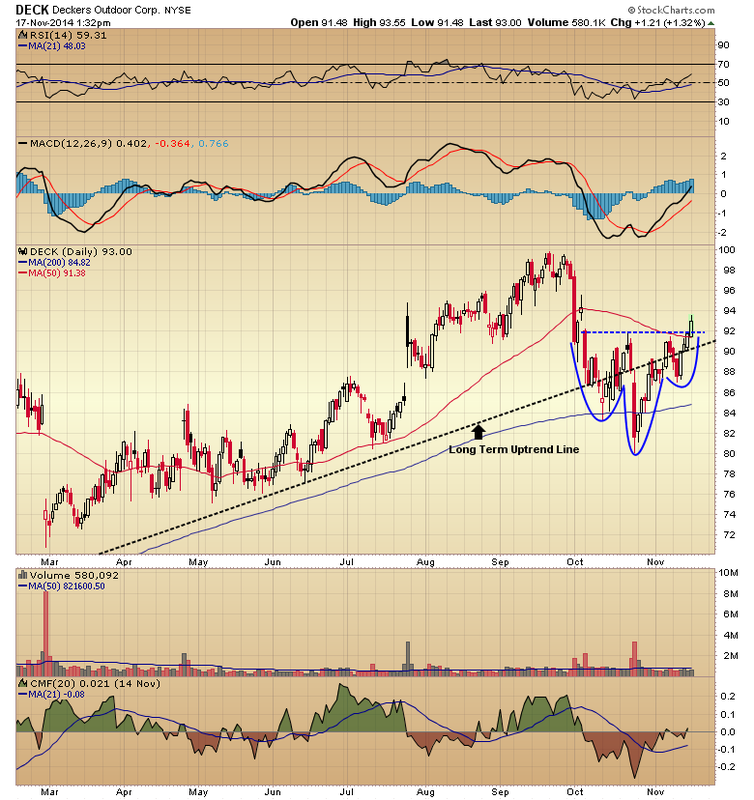 It held its 200 day average during the consolidation phase, and now is back above the long term trend line, the $92.00 neckline level, and its 50 day moving average. Price momentum and money flow indications are positive. 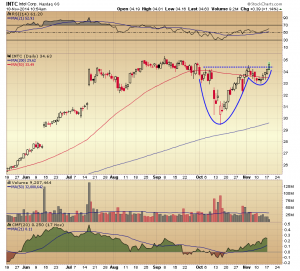 Shares of Intel (INTC) have spent the last two months consolidating under their 50 day moving average and forming a cup and handle pattern, with rim line resistance in the $34.40 area. 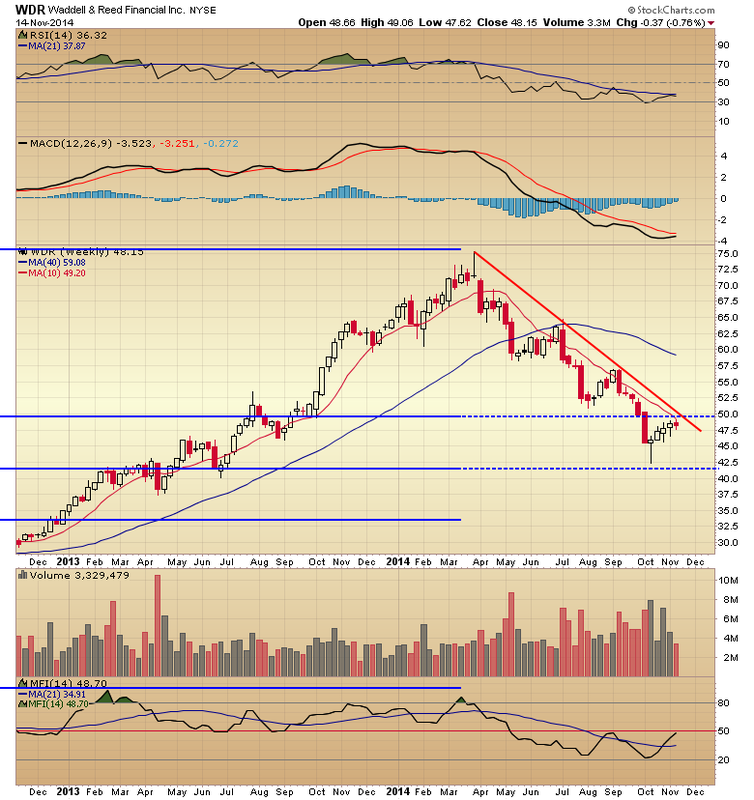 The RSI and MacD have moved above their centerlines and money flow is positive. A reader requested an analysis of the the AT&T (T) chart. 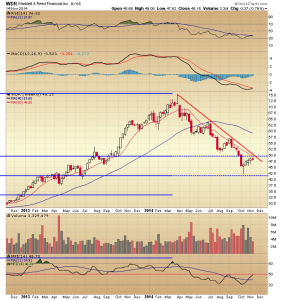 The weekly chart shows the stock price consolidating in a horizontal channel since May of this year, with support in the $33.25 area and resistance near $35.25. Shares broke and closed above the two year resistance level this week, making an all-time high. The consolidation phase has moved the Bollinger Bands (blue), a measure of standard deviation based on price, within the Keltner Channels (red), a measure of standard deviation based on average True Range, creating a classic “squeeze” condition. This is reflected in the low reading on the Bollinger Bandwidth indicator at the bottom of the chart, and often precedes volatile moves. The stock looks like a good/risk reward buy at its current level with an initial percentage trailing stop under the Bollinger Band centerline. 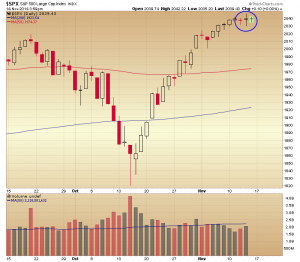 The Russell 2000 Index saw an unusual pairing of bearish candles at the end of the week. A narrow opening and closing range candle formed in the Thursday session, followed on Friday by a “gravestone” doji, a candle with a narrow opening and closing range at the bottom of its overall range. In each case, the opens and the closes were at nearly identical levels. 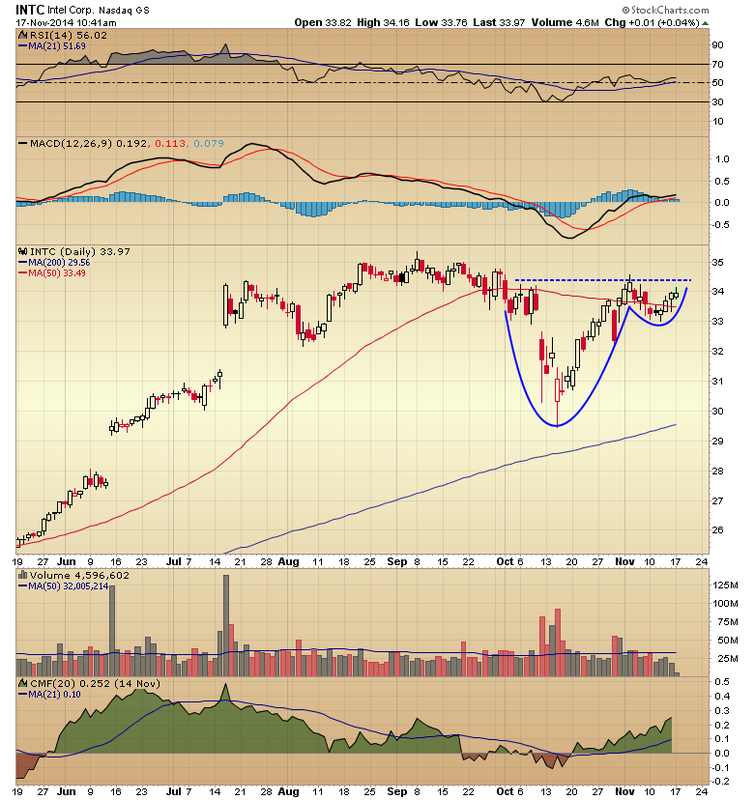 A reader requested an analysis of the Waddell and Reed Financial (WDR) charts. 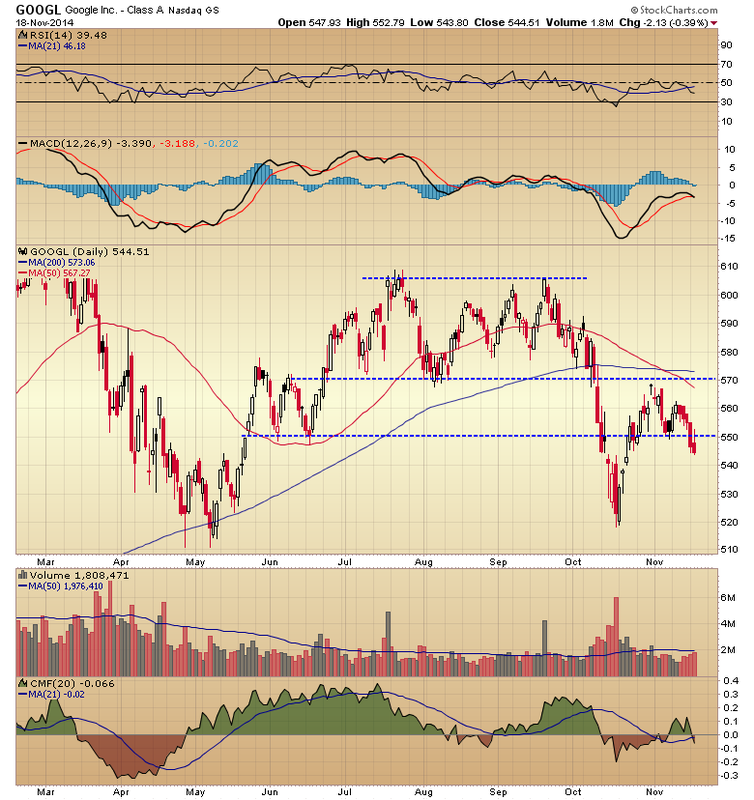 The first weekly chart shows the recent October low as a 50% retracement of the long range 2008 low and the 2014 high. This Fibonacci series is significant because, as the second weekly chart shows, the 62% retracement level is currently intersecting with other points of resistance which can be seen more clearly on the daily timeframe. 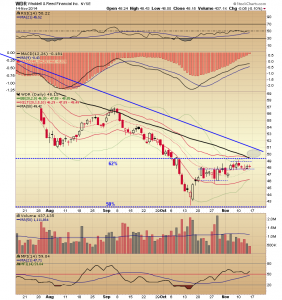 On the daily timeframe the 62% retracement level, the downtrend line drawn off the 2014 highs, and the 50 day moving average form a zone of resistance in the $49.40 to $51.00 area. In October, the Relative Strength Index and the Money Flow Index, a volume-weighted relative strength measure, moved out of oversold conditions, and Moving Average Convergence/Divergence made a bullish crossover. The stock has since traded in two series of elevated channel consolidations, and the increasingly tight price compression has taken the Bollinger Band range, a measure of standard deviation around price, within the Keltner Channels, a measure of standard deviation around Average True Range. 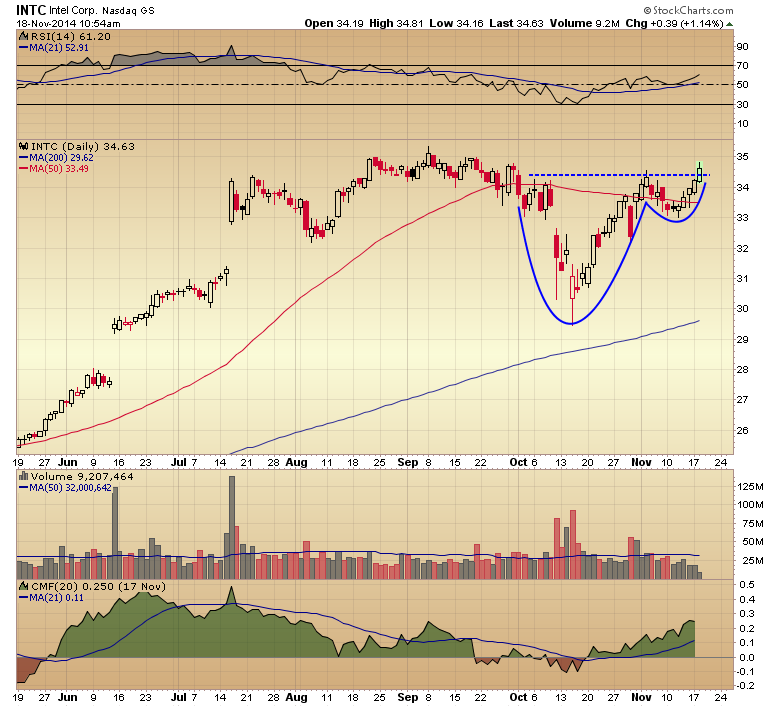 This is a classic “squeeze” situation, one which can precede volatile moves. The long to intermediate term view of the stock is that it is in a long term downtrend, moving below a clearly defined downtrend line and a declining 50 day moving average. While the short term trade set-up suggests a potentially volatile move higher, there is significant resistance just overhead. I would look to see several days of trading above the intersection of the 50 day moving average and the 62% retracement level, and ideally a close in upper candle range that penetrates the 2014 downtrend line, before taking a speculative long position. Even if those conditions were met, however, they might be part of a basing process and the stock price could revisit recent lows at some point, so a tight well-disciplined percentage stop would be required. I know what you’re thinking, “Please no more closing posts, updating the latest doji sighting on the index charts.” Today, however, there was a very rare one and it needs to be noted. 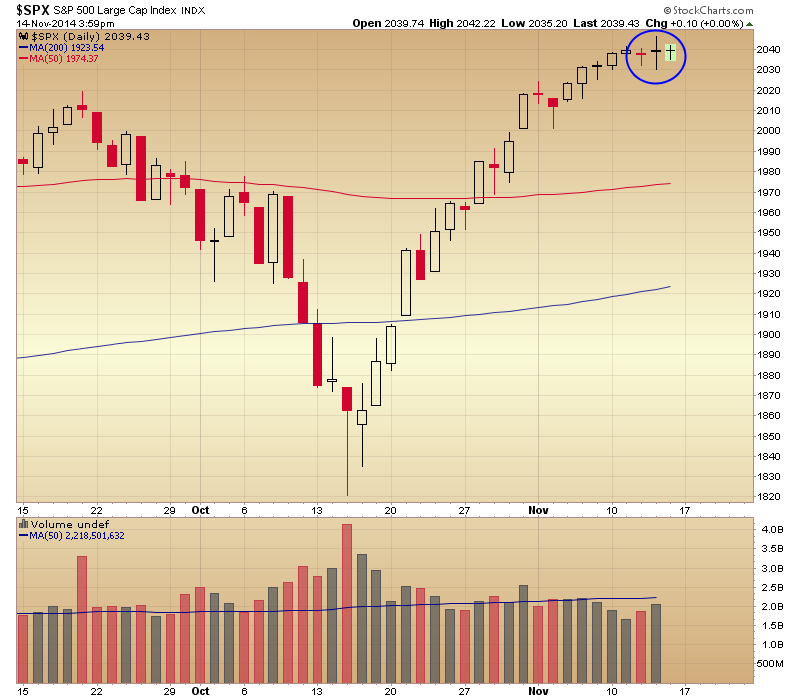 A tri-star pattern formed on the S&P 500 daily chart. This is simply three consecutive, narrow opening and closing range or doji candles, and it is a seldom seem bearish reversal formation.